As vacations and summer travel come to an end, so do a lot of outdoor activities like going to the beach or lake with your dog. But with cooler weather comes new activities to enjoy with your best friend like hiking, hunting and biking. Unfortunately, we sometimes forget that summer pests and diseases continue and may even increase through autumn and winter. Changing climates, urbanization of rural areas, suburban and rural residences all result in regional and local microclimates, sometimes limited to our own neighborhood. One of the biggest continuing risks in autumn is vector borne disease. Mosquitoes can be an ongoing pest and health hazard and can expose our dogs to heartworms and us to more exotic diseases such as Dengue Fever, West Nile virus and the latest risk of Chikungunya virus (often called Chick-v). Click here to see what risks mosquitoes pose in your area. The only disease that we know to be a risk to our dogs is heartworm disease. However, the same mosquitoes that transmit heartworms also transmit these other diseases to humans. Aggressive mosquitoe control is important to protect our dogs and people. Make sure you do all you can to eliminate mosquitoe breeding places like standing water in flower pots, old tires, bird baths and puddles. To protect your dogs make sure you continue heartworm preventive all year round. Remember, while mosquitoes may die or go dormant over winter, heartworm larvae do not die off when it gets cold. Similarly, microclimates such as sheds, garages and crawl spaces under decks and houses may never reach a temperature cold enough to kill mosquitoes. If you are in an area where mosquito populations are heavy be sure to consider using a repellent. DEET should not be used on dogs. Citrus-based products like citronella can be used safely but should be reapplied frequently. While most people consider summer to be flea and tick season, in some parts of the country autumn can be one of the worst times for exposure. 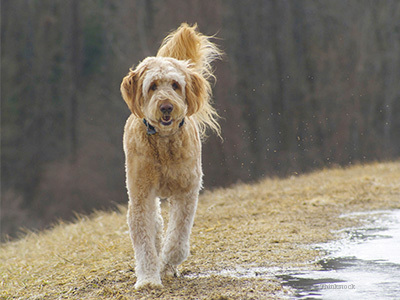 Don’t let up on flea control just because the weather gets colder! A relatively small population of fleas can explode into a major infestation at the first warm spell. Fleas are always present in rodents and wildlife, which may look for warmer environments in your attic, crawl space or garage. The best approach is to assume there are always fleas present and administer flea control as directed all year round. Click here for more flea fast-facts. Autumn is a major time for exposure to ticks. Falling temperatures in the autumn months can often cause ticks to seek warmth further away from wooded areas like the foundations in homes. Part of tick control around homes involves eliminating their favorite environments. During the autumn months, removing all leaf and garden litter helps eliminate spots where ticks can live in the winter. Keep the ground under bird feeders clean so as not to attract small animals that can carry ticks in the yard. Many ticks live in shady, moist areas at ground level, and awareness of their habitat can significantly reduce the likelihood of being bit. Ticks will cling to tall grass, brush and shrubs, usually no more than 18-24 inches off the ground. They also live in lawns and gardens, especially at the edges of woods and around old stonewalls. Those lovely large piles of autumn leaves may present a lot of fun for dogs and children but they are also great hiding places for ticks. Keep leaves removed from areas dogs and people frequent. In tick-infested areas, your best protection is to avoid contact with soil, leaf litter and vegetation. If you garden, hike, camp, hunt, work or otherwise spend time in the outdoors, you can still protect yourself and your dogs. Use effective tick control and repellent products and check yourself and your dogs any time you have been in tick country. Fall is my favorite time of year and I like to take my dog for hikes. Are there any dangers I should be concerned about? Can I safely let my dog run in the fields without a leash? Are ticks and the diseases they transfer of any risk in Fall?